Sir Alex Ferguson refers to Cafu as the Brazilian with two hearts, such was the stamina of this soccer legend that he could go on playing for hours at a stretch. He was part of Brazil’s team which is considered to be one of the greatest teams in the history of the sport. That side of Brazil has been voted as the UEFA Team of the Year twice. Cafu is regarded by many as the greatest fullback ever to grace the game. He is one of the only few, and these are very few, players to bring home two World Cups. All these accomplishments come as no surprise thanks to this legends perseverance and grit when it comes to his focus in the soccer field. Due to his humble beginnings, something which he never forgot, Cafu now runs a charity foundation in his old neighbourhood of Jardim Irene. The foundation encouraged young Brazilians to dream big. Born as Marcos Evangelista de Morais in 1970 in the very poor district of Jardim Irene in Sao Paolo Brazil. One of six children the initial 18 years of Cafu’s life were quite tough and there were often times when there wasn’t even enough food to feed the family. All of this is what made Cafu the man he is and he never forgot his beginnings. By the time he was seven he was able to join a soccer academy for youngsters. What followed next was a strong of rejections from other clubs when Cafu was a teenager. He was 18 by the time he was finally accepted in his hometown team of Sao Paulo. Initially Cafu started off as a right-sided midfielder and he then converted to the right back position once he discovered where his talents were. Soon he was an expert in this position and with his strong talent guided his team to back to back Copa Libertadores in 1992 and 1993.This was followed by legendary spells in Roma, Milan, Real Zaragoza, Juventude and Palmeiras. It was playing for Brazil which firmly established Cafu as the ultimate legend. In total he made 142 appearances for his home team and to this day he remains the most internationally capped male Brazilian player of all time. He represented Brazil in four FIFA World Cups in between 1994 to 2006. Under his captaincy he guided his team to three World Cup finals – one of which they won. He also played a vital role in Brazil’s Copa America titles in 1997 and 1999. He was also the member of the team which won the 1997 FIFA Confederations Cup. In total he picked up 21 trophies in a career spanning Brazil, Spain and Italy. During his spell in Italian clubs he was nick named Pendolino in reference to the country’s speedy express trains. 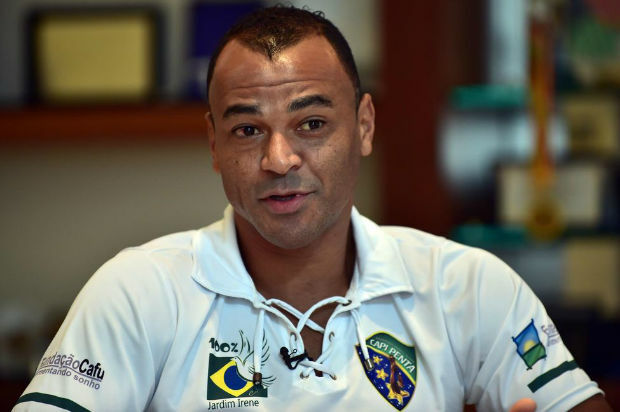 Cafu was the South American Footballer of the Year in 1994. Pele named him as one of the 125 Greatest Living Footballers in 2004. He has also been included in both AC Milan and Roma’s Hall of Fame.